I recently took another look at my predictions for the Vikings final roster. I had a couple of minor changes to who I thought would make the cut, but the biggest one was that I am now predicting that Tarvaris Jackson makes the cut over John David Booty. First off, Jackson is simply a more reliable quarterback at this point than Booty. Booty is still in the developmental stages, and that’s fine. In fact, I’d bet Jackson wishes he could’ve just sat on the bench for the first three years of his career as well. However, when push comes to shove, Jackson is the better of the two players. Second, Jackson’s contract is also pretty manageable. At $530,000 and one year remaining, the Vikings can afford to keep him on the bench. JDB’s cap hit is smaller, but it’s not a wide enough gap to let the less capable player remain on the team. Third, the Vikings have made a commitment to giving fans what they want to see… the WildCat offense. In order to use the WildCat in an effective manner, you have to have a very real threat through the air. Sure Chester Taylor and Percy Harvin can probably throw a decent pass from time to time, but Jackson is a great fit for the WildCat given his mobility and throwing ability. If the Vikings are truly going to give the WildCat a 100% effort then I do not see how they can cut him. Fourth, Jackson’s trade value is probably not too high at the moment. As Chris Boynton pointed out in an earlier article, the Vikings would be lucky to get a 5th rounder out of him right now. So let’s compare the possibility of trading Jackson for a fifth or sixth rounder right now to the prospect of keeping him. If the Vikings kept him on board his manageable contract would expire after this season. 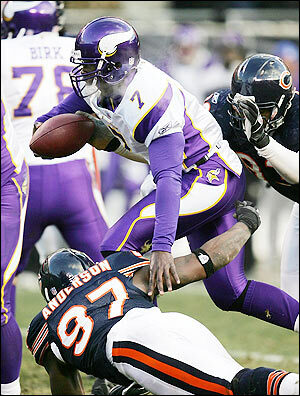 However, the Vikings could tender him as a restricted free agent next year. They again would have a fairly manageable contract if Jackson signed said tender. Let’s say they tender him at the second or third round level and a quarterback desperate team pounces. Well, then the Vikings have just received a second or third round pick plus an extra year of service out of Jackson rather than simply trading him for a fifth round pick today. Fifth, JDB has a 50-50 chance of hitting the practice squad. If the Vikings hold off until the last minute to announce they’ve cut John David Booty, and the market is flooded by teams making their respective roster cuts, then Booty might just make it to the practice squad and nothing would be lost. Considering the relatively unexciting prospect Booty has become, that just might be a risk worth taking. 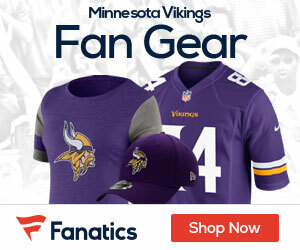 I predict that the Vikings opt to take their chances by cutting John David Booty unless they get a very nice trade offer for Jackson. If someone like the Forty-Niners or Denver Broncos were to get desperate and offer a 3rd or 4th rounder then the Vikings will have no choice but to pounce on that. Also, conditional picks have become a very popular tool when dealing quarterbacks. However, it makes too much sense to keep Jackson around until a real long-term answer for quarterback is found, and I’m sorry but Favre and JDB are not it.